Process walnuts until finely chopped. Sift flour into a bowl. Stir in sugar and walnuts. Whisk egg, oil and milk together in a jug. Gradually add egg mixture to flour mixture, whisking until smooth and combined. Cover. Set aside for 30 minutes. Spray an 18cm (base) non-stick frying pan with oil. Heat over medium heat. Pour 1/4 cup batter into pan. Swirl to cover base. Cook for 2 minutes or until light golden. Turn. Cook for 1 minute. Transfer to a plate. Cover to keep warm. Repeat with remaining mixture to make 8 crepes. 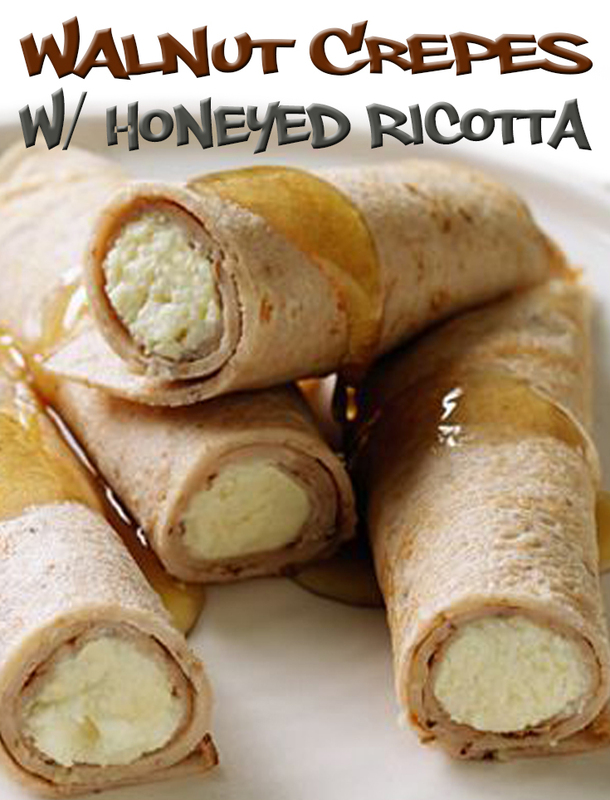 Place ricotta and 2 tablespoons honey in a bowl. Stir to combine. Top 1 crepe with 1 1/2 tablespoons ricotta mixture. Roll up to enclose filling. Repeat with remaining ricotta mixture and crepes. Serve crepes halved and drizzled with remaining honey.